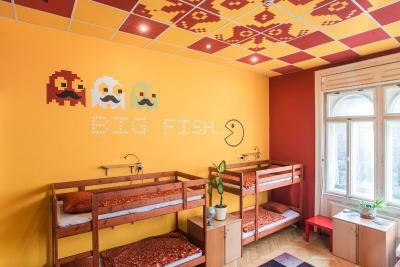 Lock in a great price for Big Fish Budapest – rated 9.1 by recent guests! Nice staff. Cool rooms. I will definitely come back here. They do a good job maintaining the property, bathrooms are very clean for a hostel. Beds are already made and they provide towels. This place is immaculately clean and maintained. There are little shelves with plugs next to each bunk so that you don’t have to army crawl across your room and secretly unplug someone else’s stuff in the night to give your stuff a charge. There is loads of free stuff In The fridge, kitchen, and bathroom, so that if you’re a free loader like one of the [swell] volunteers that will remain nameless, you can take it! There is a projector for the odd movie night that will draw people in who will then all have so much fun the movie gets shut off. All of the staff were stupendous. Especially Phil...even when she was strategically placing a clown doll around the hostel to frighten me. There are activities everyday. common room has microwave, stoves and refrigerator. Provide hairdryer and free coffee. 1. Free milk and coffee! 2. Including towel! 3. The volunteers are so welcoming and always smile, very warm-hearted. What can I say? 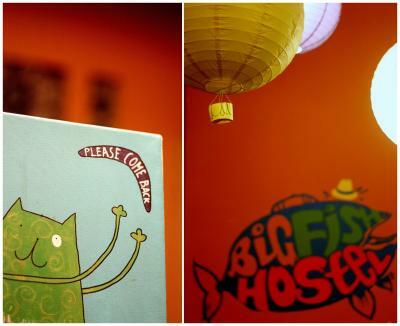 Big Fish is an amazing, friendly backpacker's hostel. The staff and volunteers were awesome and made budapest feel like home. They gave me some great recommendations to their favourite places - which I would never have found by myself! Wifi was super speedy. Place was spotless! Such a beautiful, cozy little spot, it was difficult to leave! I'll definitely be back soon! Cleanest hostel I've ever stayed at, hands down! Super friendly and helpful staff, they knew everything about the city and recommended me some great places. They really make you feel at home :) thanks Big Fish! Big fish was super awesome! The volunteers were friendly and very helpful. They organised events and were very willing to provide wonderful suggestions about what to do in Budapest. It had a great atmosphere and was very clean. Staff's kindness is unparalleled. I got sick and Jess took care of me. Truly amazing ! 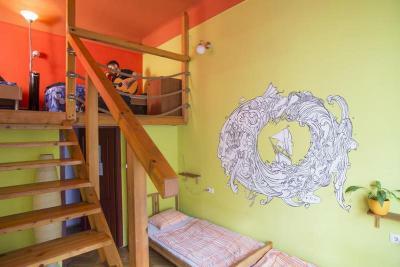 This colorful modern hostel is 3,100 feet away from Budapest's Oktogon Metro Station or the Jewish Synagogue. 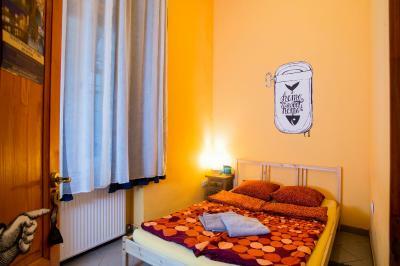 Big Fish Hostel offers free Wi-Fi access, a shared well-equipped kitchen with microwave and free tea and coffee. 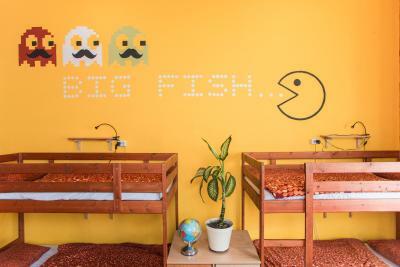 All rooms at the Big Fish come with hardwood floors, wooden furniture and they are individually decorated with playful elements. 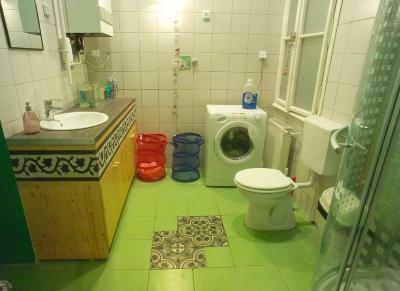 The spacious tiled bathrooms with showers are shared. In the shared area the property has a widescreen projector and a computer. Guests can listen to music or watch movies widescreen. The washing machine and the dryer can be used for a surcharge. The apartment is located in the ruin pub area at Wesselenyi tram stop. 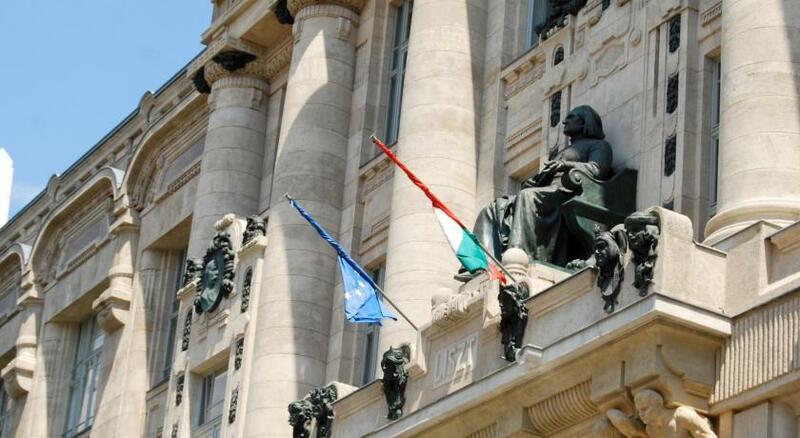 The Hungarian Parliament is a 16-minute metro ride away. Keleti Railway Station is 0.9 mi away. When would you like to stay at Big Fish Budapest? 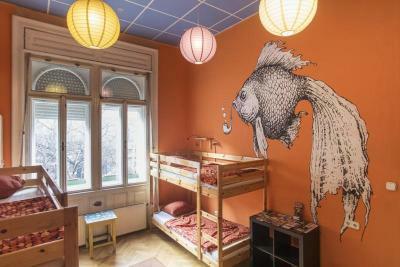 House Rules Big Fish Budapest takes special requests – add in the next step! Please inform Big Fish Budapest of your expected arrival time in advance. You can use the Special Requests box when booking, or contact the property directly using the contact details in your confirmation. I guess the only thing that can get improved is the quality of beds. The beds were a bit old so they got noisy when people moved during the night. The best two things about this hostel were the lovely staff and the great location. I really enjoyed talking to the personnel. They were very friendly, respectful and tried to help me with anything I needed. The location of the hostel was also amazing. A very short walking distance to the Danube river and inner city. With a very vibrant neighbourhood. Loved it. 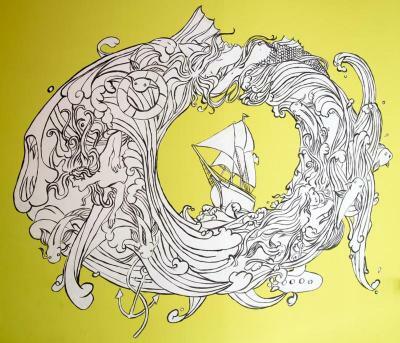 Best hostel ever thanks to the volunteers that create the vibe! Kindness is the word to describe the atmosphere in this hostel. 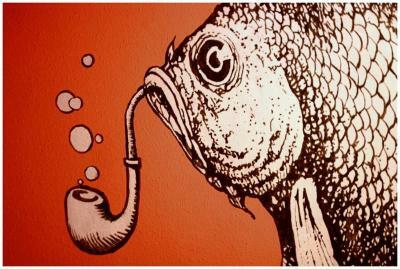 In a group or alone, to visit or party, you will always find your place at Big Fish. I had the chance to find new friends that I’m sure I’ll see again. We went out to ruin bars from the first day, went to local and authentic baths, did a walking tour through Budapest and even went on a road trip to Lake Balaton. Special thanks to Yann, Laura, Diego. Jane, Ben & Alex! The only thing I can think of is the mainly weekend night noise from the pubs & bars within just a few steps from the house, but it was not terribly bad in February. When there is a chance, it would be great to change the old windows to new ones that will provide better sound and heat isolation. I loved pretty much everything!!! It's a huge apartment with a few rooms only, the size of it and the volunteers who stay for longer, make the place like a home shared by friends. Nice people, and the employed staff are also awesome, helpful. 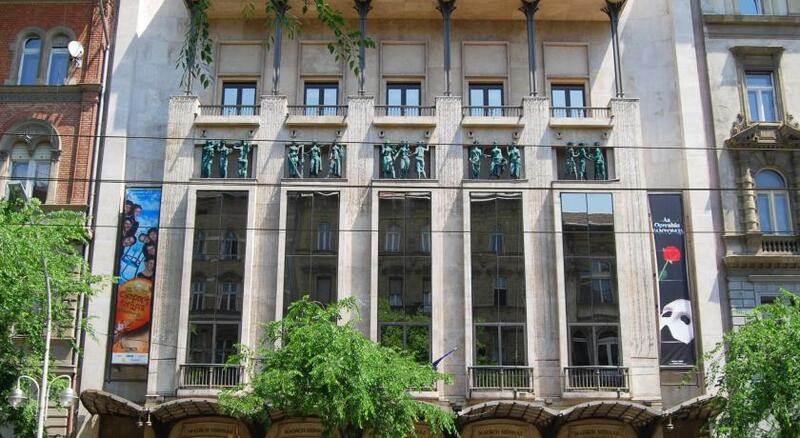 Great location with excellent public transport and other infrastructure, you get the Körút feeling of Budapest. The design, the coffee, tea etc, the kitchen, the bathrooms, the general mood - it's just all cool. 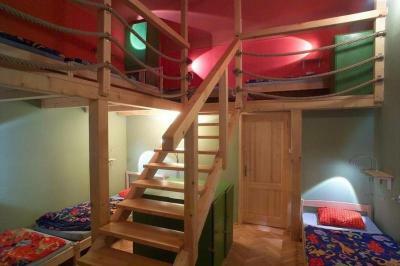 I am very glad to have discovered this little gem, I extended my stay and this will be a top choice when I need a hostel in Budapest in the future. Location was extremely convenient, very much in the middle of everything you need, staff are amazing, atmosphere was lovely, cute interior, the cleanest hostel that I've ever been, definitely a superb stay! In the room I stayed it would be more convenient to have a locker close to every bed. Since somehow my bad has been placed just near another girl's locker, every time she would open it, it would disturb me and for her I believe it was not convenient either. Location was perfect, close to everything, but the biggest advantage of this hostel is their supportive staff! Everything looks cozy and hommy. Really nice hostel, the staff is just wonderful and the rooms are pretty big with nice decorations. Loved my time there. 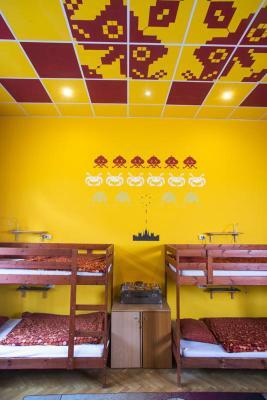 I wouldn't say anything wrong about this hostel. Just... the photos here are older. There is more furniture now. It was really lovely hostel. 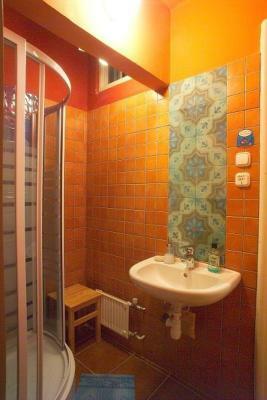 Perfect location, near to tram station and located on the street full of bars and shops. The accommodation is comfortable and we felt like home. Bathrooms are cleaned every morning. There was everything we needed for our trip there. Everything was great really, the location, the rooms and facilities were great for the money, the people were all so friendly and helpful, just overall a very good experience,will come back for sure! The staff were friendly, bunks were comfy, facilities great. Good vibes here.